Canna must be the easiest of tropical plants to grow in a cool climate. They are grown for their lush tropical foliage and their flamboyant tropical flowers. I would classify them as a root hardy plant. The rhizomes should survive in the ground if protected by a thick layer of mulch. They will not survive if the ground freezes solid. They basically come in two groups. The species canna and the hybrids. Species canna theoretically are naturally occurring plants. The hybrids have been genetically modified. Selectively breed by people who enjoy doing such things. There are a reasonable number of species canna, and a huge selection of hybrids. The canna hybrids have much larger flowers but are rarely available to grow from seed. I like to grow species canna from seed. This is due in part to my somewhat thrifty nature and in part to prevent (as far as possible), introducing Canna virus into the garden. Your canna flowers should provide you with a life time supply of seeds. So after a modest out lay for a packet of seeds you should soon become self sufficient in seeds. 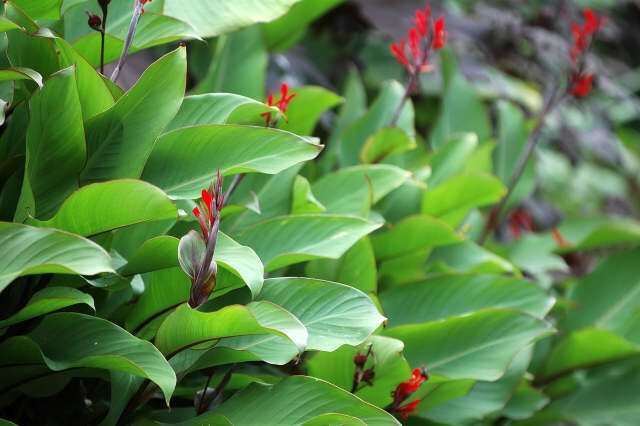 The plant featured in the above image, is Canna Warscewiczii. This was the plant that got me into this whole mess in the first place. Canna are a very obliging plant. They are quite hard to kill, in fact it is important to crush any surplus rhizomes before composting other wise you will end up with a flowering canna patch in your compost bin. They are quite tolerant of drought although they will not flourish under poor conditions. You may find after a few years that you have more canna plants than you can use or give away. These plants wait patiently, leaves curled, their pots dry as a bone, for their chance to grow. As soon as it rains, the leaves unfurl and normal activity is resumed. How to chip canna seeds ready for sowing. Pictures of young canna plants at various stages of growth. Canna from rhizomes will show you what to do with your rhizomes if you ordered them online/mail order. Lift your plants from the ground. How to clean and prepare your canna rhizomes for storage over winter. How to divide your plants to create new ones. How to keep your canna plants safe in the ground over winter and coax your plants back into growth the following season. Canna pests and diseases include aphids, slugs and snails and the canna virus. Find out how to minimise damage from these beasts.